Everyone is welcome to attend LAG's talks, but membership [Membership] gives a reduced entrance charge. Members also receive the newsletter and receive invitation by e-mail to special activities, such as walks or tours. For further information, please contact Paula Stanyer by email at paulawodcohen (at) yahoo.co.uk. Mike is also Visiting Research Fellow in Environmental Archaeology, Bournemouth University. Mike will commence the celebrations of LAG's 50th anniversary with a talk looking back to LAG's early excavations and research and how this relates to more recent developments. (Fisher St entrance, lift access available). Lectures will resume in the Autumn. Click here for the full 2018-2019 programme. LAG visit to Plumpton Roman Villa. The fact the Group will be celebrating its 50th birthday in 2019 is a great achievement. When it was established a number of long standing archaeological societies already existed. The Sussex Archaeological Society was founded in 1846, the Eastbourne Natural History and Archaeological Society was founded in 1867 and in the early 20th century there followed the Brighton and Hove Archaeological Society in 1906 and soon after the Worthing Archaeological Society in 1922. LAG was founded by John Houghton a local historian, Jock Knight Farr who was a local council worker (digging roads, hedging and ditching) and Ted O'Shea who was a professional surveyor. LAG soon enlisted Richard Lewis to run its excavations. This though, is not the time to review our 50 years, but it is a great achievement. The Group has undertaken many activities, held events and produced publications. We are just starting to plan how we might celebrate LAG's silver jubilee. Please help with your ideas, and with organising and participating in our events – just email Paula or phone on 07814 463 259. We like ideas but we also like offers to help provide activities! I was honoured and flattered to be asked to be your President. I know a number of members having been involved in archaeology in the Lewes area for about 45 years but there are some don’t know me, and who I heard asking questions like, who is he?, what has he done anyway? … so to you don’t know me so I thought I'd say a few words. I started my interest in archaeology as an 11 year old schoolboy in Lewes, and in 1973/4 started digging at the Groups rescue excavation of the Bronze Age round barrow on Round-the-Down with Richard Lewis, and subsequently at the Priory with him. Both my parents were interested and also started digging; regularly turning up on sites as a family. 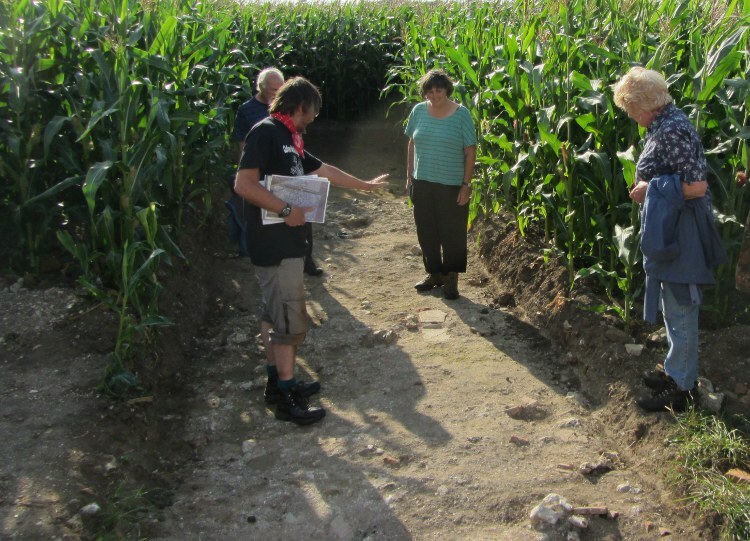 My mother had started adult evening classes – I would wait up for her to return to read her notes – it was decided this was pointless so, with permission from County Education Officer, I attended archaeology adult evening classes from the age of 13. I read archaeology at university and then went on to study at the Institute of Archaeology concentrating on environmental archaeology (esp., soils, sediments and snails). Following graduation and excavation of Ashcombe Bottom dry valley with LAG, I did a PhD at Southampton University then was the first environmental manager at Wessex Archaeology running that section for nearly 20 years before becoming being a freelance environmental and geoarchaeological specialist and building my own lab. I have worked on and am working in the Stonehenge and Avebury landscape, and Dorchester and Cranborne Chase and in Sussex on the Westhampnett bypass. I've worked in France, Germany, Malta and Cape Verde and published widely (about 15 monographs/books, many articles and 100s of contributions), with my recent local books include Eastbourne; aspects of archaeology, history and heritage (2014), Archaeology of the Ouse Valley (Moore, Allen & Rudling, 2016), and my textbook Molluscs in Archaeology (2017). I am a Fellow of the Linnaean Society, awarded fellowship of the Society of Antiquaries (FSA), and have been a member of IFA (MCIfA) since c 1996). I am member of the executive council of the Prehistoric Society, former President, and now Vice President, of the Conchological Society of Great Britain & Ireland, Series Editor of the Prehistoric Society peer-reviewed Research Papers Monograph series and, in an unpaid capacity, am Series editor of Oxbows Studying Scientific Archaeology Series, and their Insights series. I followed both my parents onto the committee of LAG (my mother was the newsletter editor for 23 issues over 4 years, and a former VC), becoming Vice Chairman in 1984-7, during which time I excavated Ashcombe Bottom (SAC 2005), ran a Lewes symposium and a Lewes Archaeology week. So I was honoured to have been asked to be your president, and as I feel the Group gave me many opportunities (which I readily took) - it nurtured and helped me into my subsequent career; in my term as President I advise the Group with is work, and with celebrating its 50th anniversary.